The unique Palkhor (Baiju) Monastery is situated about 143 miles (230km) south of Lhasa and 62 miles (100km) east of Shigatse, at the foot of Dzong Hill. It has an unusual structural style and houses a collection of pure silk costumes worn in Tibetan opera, all richly embroidered, that date from the Ming and Qing Dynasties. 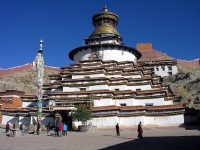 The architecture of the monastery is diverse, incorporating Han, Tibetan and Nepali styles. The monastery is also unique in that it is the only one known to accommodate monks from three different Buddhist orders: the Gelugpa, Sakyapa and Kahdampa monks all get along famously. The main hall of Palkhor Monastery is about 500 years old. This famous monastery is a popular pilgrimage site and houses a number of shrines and frescoes: the 18 Arhat clay sculptures in the Arhat Shrine are renowned throughout Tibet. The most famous attraction of the monastery, however, is the Bodhi Dagoba, a building consisting of nine tiers, with 108 gates, that houses 76 shrines to Buddha. The views in the area are phenomenal and visitors will be enchanted by the location and the devotion of the pilgrims who flock to the site.